Finalized in 2015, The Western Perspective and Western Agenda report documents and demonstrates to decision makers and stakeholders the value of the Western U.S. and the contributions of Western Land-Grant Universities to the nation’s agricultural economy. Click the cover image (left) to view/download your copy [PDF, 28 pages]. The Western Perspective and Western Agenda Summary is now available for use to communicate with decision makers and stakeholders in your state, the region, or nationally. Download the WP/WA Summary User Guidelines. WATCH!! 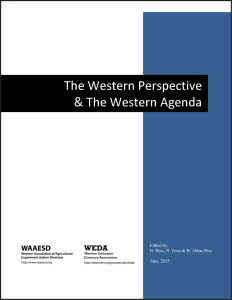 The Western Perspective and Western Agenda Summary is now available as a video! Contact Sarah Lupis for additional information or Adobe InDesign files.